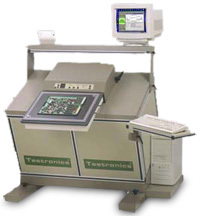 The 406C is an open architecture power up test platform designed to facilitate the implementation of functional testing after the MDA test is completed. Internally dubbed as "Armadillo" the new architecture provides the user almost unlimited flexibility by combining the best of the VME buss and a dedicated ICT buss. The 406C comes as a basic platform with your choice of receivers interfaces. GR2270 for a maximum of 1600 test points, GR2272/2286 for a maximum of 3840 test points,and Teradyne Z1800 for a maximum of 2048 test points.An ergonomically designed tilt cabinet houses the complete system. Switch cards can be mixed and matched based on your applications. Solid State Switches and Reed Relays can be combined to offer a low cost package, and still meet the application requirements. Custom features, application specific circuitry, IEEE, and VXI instrumentation can be easily integrated into the 406C for power-up functional testing. The 406 WinTOS software [test executive] supports external program calls. This means a customer can write an application specific .exe program. This exe program can do things like control IEEE instruments, power supplies, frequency counters, etc. They place the .exe inside the WinTOS test program along with any arguments necessary. The 406 will perform all of the standard analog in-circuit measurements, then it will call their .exe when it reaches that point in the program. WinTOS will then spawn the exe along with arguments. The exe executes. When the exe is finished it exits passing arguments [pass, fail, measured results, etc] back to WinTOS. We then continue with the WinTOS test program performing any additional 406 tests or even additional exe tests. WinTOS supports conditional branching so they have a lot of flexibility to run different exe's based on prior test results. This is the technique we use with a major automotive radio manufacturer. We use our standard test program to check for all of the process faults. We also power up the assembly and make several voltage measurements using an HP IEEE power supply and a Kiethley IEEE DVM. (WinTOS supports IEEE instruments from inside the test program without having to use an exe.) While the board is powered up, we spawn an exe that writes digital signals to the VF display, thereby changing the display's segments. The exe controls two National Instruments digital I/O cards. This is typically how we use the 406 as a combinational test system. For additional information about this model, see Architecture Details, or explore the resources recommended on this page. For personal assistance regarding this or any Testronics product, call 1-972-542-3111, email info@testronics.com, or click the link provided below.